S lives in the Middle East where she teaches English and leads a local church-planting team. She writes about her experience as a Christian living in a Muslim-majority country during the fasting month of Ramadan (26 May to 24 June in 2017). How are we to engage with Muslims in Australia today? On Saturday 17 June 2017, leading expert on Islam, Dr John Azumah, gave a public lecture at Moore Theological College in Sydney on how to understand and engage with Muslims today. Gordon Cheng reports. 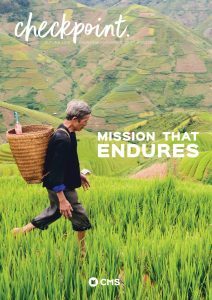 Every Christian is intimately involved in God’s global mission – and our prayers are powerful, writes David Williams, CMS Development and Training Secretary. Lachlan* and his family have recently returned from serving as CMS missionaries in a Muslim-majority country. Checkpoint asked Lachlan to share some tips on sharing the Bible with those from a Muslim background. CMS workers are actively engaged with Muslim people in many parts of the world. Dr Richard Shumack has mentored workers in how to share the Bible with Muslims at St Andrew’s Hall and through the Mentac (Mentoring Across Cultures) training program. In his experience, there are abundant opportunities to share the Bible with Muslims … if we are willing to try.